This ultra modern, large volume well loved cruiser, with good family accommodation inside and out will impress. Economical boating with a 5.7 EFI V8 Volvo giving good performance and single engine service savings. Tasteful interior finishes and a host of luxury features with certainly impress. These later model Mustangs rarely come up so check it out and compare the clever use of space compared to other similar sized and priced boats. 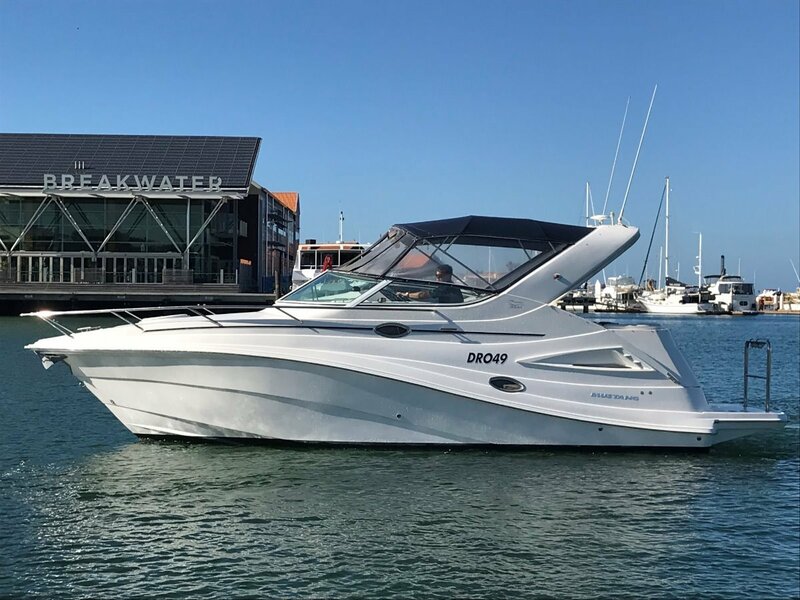 Contact Travis Mansfield at Mansfield Marine Brokers to arrange an inspection of this vessel that is currently at Hillarys. Call 0419911560. If you are from the East Coast then we can arrange delivery to you. Why choose Mansfield Marine Brokers to buy or sell? Mansfield Marine's consistent success in selling and repeat business with buyers is due to a number of factors that simply help to get the job done without any fuss. We are the truly qualified ONE STOP MARINE CENTRE. 1/. Our brokers are not just sales people, they are all mad keen boaties themselves and mostly Shipwright's / Boat Builders, that each have between 15 and 45 years of experience building, maintaining and selling boats. There is no substitute for experience. 2/. We have the BEST EXPOSURE sales locations in WA. FREMANTLE office on the corner of Mews Road and Capo D Orlando drive with Brokerage office and rear showroom for trailer boats, then we have our head office in HILLARYS with millions of eyes on our 19 PREMIUM DISPLAY pens / brokerage listings at Hillarys Marina every year. We often sell boats to people not even looking to buy with our unrivalled impact exposure. Our locations, coupled with various print and media advertising we bring the sellers and buyers together! 3/. Mansfield Marine buy and sell boats all over Australia. Our vast network of brokerage alliances throughout Aus and beyond ensure that if you want to buy or sell, you are not limiting yourself to a small local broker. Often carrying around 150 Brokerage Listings and having imported more than 200 power and sail boats over the past 15 years alone we know where to get exactly what you want. We often sell boats to East Coast buyers. We dismantle and reassemble vessels and arrange trucking / shipping where required, either over east or overseas! 4/. In addition to our team's keen moral compass, we work as members of the Marine Brokers Institute of WA which sets firm guidelines for our industry conduct. We handle every aspect of your sale or purchase from offer documentation, conducting sea-trails and inspections with surveyors and mechanics, and finally handle all financial settlement and registration transfer documentation, whilst utilising trust accounts and conducting ownership verification to ensure that the boat you are buying or selling is not financially encumbered elsewhere. 5/. We don't just throw you the keys, we offer extensive handover and vessel orientation if you need a hand getting started. We can arrange pen rope setup in your new berth, assistance with pen / berth procurement, maintenance plan recommendations, or anything else you need to keep you comfortable with your new purchase. 6/. If the boat you are looking to buy or sell needs some love, upgrades, a refit, repairs, or just a good polish to get it ready for sale or if buying, add your personal touch to a new purchase, then our in house team of Shipwrights, detailers etc, can give you a fixed quote so you have no third party arrangements to worry about. We are truly qualified ONE STOP MARINE CENTRE!